UNIFY transfers money how you want and where you want—without excessive fees. Recurring transfers? Set ‘em and forget ‘em. Wire transfers? We have those too. Fast and easy transfers are just the beginning. eBanking keeps you connected to all your finances—wherever and whenever. Automatic Transfers – Set up one-time and recurring transfers between your UNIFY accounts or external accounts. 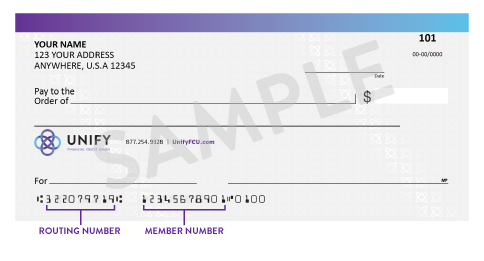 Cross-Member Transfers – send money to another UNIFY member’s account. External Accounts – Add an account from another financial institution to your eBanking account for money transfers. MOVE MONEY Between your own UNIFY accounts. From your UNIFY account to another US financial institution. From your UNIFY account to another UNIFY member’s account. USING eBanking. eBanking. eBanking or Automated Telephone Banking. SET UP One-time or recurring. One-time or recurring. One-time or link accounts. FUNDS GET THERE Immediately; or as scheduled. As scheduled, or as soon as the next business day. As scheduled, or as soon as the next business day. YOU WILL NEED eBanking access. The receiving account bank routing and account numbers. Allow 1-3 days the first time for account verification. The recipient’s name and member number. * Regulation D is a federal regulation that limits the number of electronic transfers or checks from a money market or savings account. Under Regulation D, a maximum of six (6) transfers per month from a savings or a money market are allowed. These transactions include phone requests, overdraft transfers, online banking transfers, ACH transfers, email requests and faxed requests. There are no limitations on ATM, in-branch or shared branch transactions. Reliable, validated transfers of funds when the situation requires it. Domestic Wire Transfers – Send money from your UNIFY account to a third party or another financial institution. International Wire Transfers – Send money from your UNIFY account to a third party or another financial institution outside of the United States. USING A UNIFY Wire Transfer Request delivered to any UNIFY branch.4 Bring a valid government-issued picture ID. A UNIFY International Wire Transfer Request delivered to any UNIFY branch. Bring a valid government-issued picture ID. Complete legal or DBA name. Any special instructions that may help proper credit on the form, such as an escrow account number. Account number; BAN required on all European accounts. To protect members’ assets, security measures have been instituted to ensure Wire Transfers and other requests are legitimate. These measures, which include enhanced member identification, may result in delays in processing wire transfer and other requests We appreciate your understanding as we work to ensure our members' assets are protected and encourage members to monitor their accounts. UNIFY’s Routing Transit Number: 322079719. Fee to receive incoming wire transfer is $10. 1 UNIFY recommends you contact the receiving party for the wiring instructions. All wires may take from 1-3 days for processing from your UNIFY account. A $25 fee applies for outgoing domestic wire transfers and a $100 fee applies for international wire transfers. 2 When wiring to escrow or title companies must provide beneficiary address and provide a reference number, such as an escrow or file number and property address. If wiring to an investment company, be sure to include the name and account number with your investment company and any other pertinent information regarding your investment. 3 Eligible countries: Japan, Canada, Australia, New Zealand, Austria, Belgium, Croatia, Cyprus, Czech Republic, Denmark, Estonia, Finland, France, Germany, Greece, Ireland, Italy, Luxembourg, Malta, Netherlands, Poland, Portugal, Spain, Sweden, and United Kingdom (including England, Scotland, Wales and Northern Ireland). 4 Faxed wire requests will only be accepted for property purchase or refinancing escrow/title requests. Exceptions may apply. 5 To protect members’ assets, security measures have been instituted to ensure Wire Transfers and other requests are legitimate. These measures, which include enhanced member identification, may result in delays in processing wire transfer and other requests. We appreciate your understanding as we work to ensure members' assets are protected. We encourage members to monitor their accounts.